Carton flow racking system offers an ingenious solution to the product-flow problem. 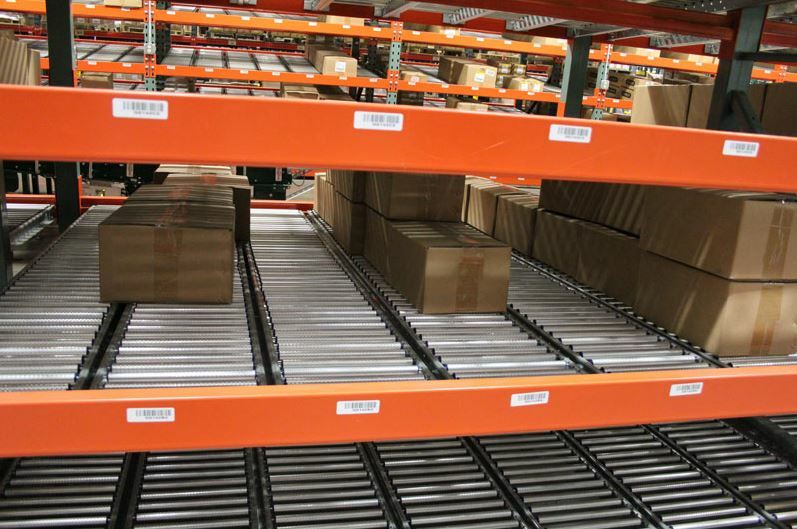 It is a gravity-powered racking system where the racks are sloped and aided by rollers or wheels. The loading aisle is in the back while the picking aisle is up front. Employing the First-In-First-Out (FIFO) method the movement of products is seamless. The inclined or sloped shelves offer increased visibility and efficient flow. When a carton is taken off the rack from the picking aisle, another carton automatically slides forward to take its place. The system is simple and independent. It does not depend on electricity to maintain the flow. However, its flexible nature ensures cohesive merger with automated conveyers to further enhance productivity. 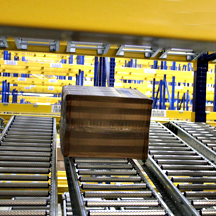 There are two common types of carton flow rack – Roller Lanes and Wheel Beds. Roller Lanes are typically designed with full width aluminum or steel rollers placed between two channels, each of which operate on an independent axle. This allows the rollers to operate and turn independently of each other. The full width rollers allow the weight of the cartons or totes to be evenly dispersed and lessens the chances of the roller wheels leaving an impression on the cartons. Wheel Beds are designed with rows of plastic, aluminum or steel wheels placed between two channels. The rows of wheels are each mounted on a single axle. They typically are patterned with staggered or alternating wheels to help distribute the weight of the totes or cartons. This helps to make sure that no single or group of wheels carry more weight that others, which helps reduce the chances of impressions being left on the cartons. 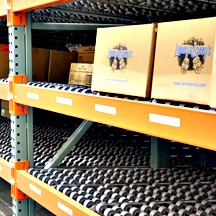 Carton flow rack systems work well for warehouses of varying kinds and sizes. It has the capacity to accommodate applications with various stock-keeping units (SKUs). It is a high-density system allowing case-pick and piece-pick application. It has the flexibility to deal with items of varying sizes effectively. To make the system more reliable and efficient, optional impact decks and intermediate supports can be used. 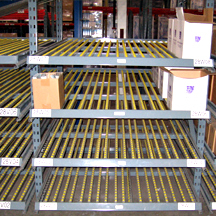 Guides can be installed to create individual lanes and make racking more accommodating to different products. Tilt trays can make unloading more convenient. Carton flow racking makes financial sense. It increases labor efficiency many folds. Automatic organization and rotation of products from back to front aisle gets the job done in fewer labor hours. 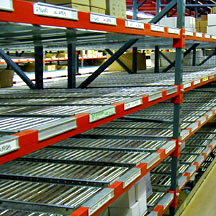 Compared to other racking systems, carton flow racking uses 22% less floor space and increases the storage space by up to 60%. To further enhance space-economy, a multi-level system can be installed.